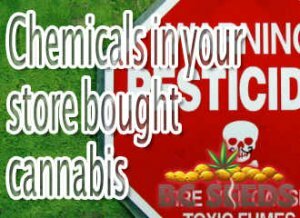 The government doesn’t want chemicals in your store bought cannabis. With cannabis becoming a commercial crop, it now has to meet government regulations. In legal states, another problem has cropped up. One you may never have thought of before. And that is growers using pesticides. While you may have thought legalizing cannabis would solve the black-market problem of chemical contamination, this is not so. Now that cannabis is a regulated crop, even some legal growers are using pesticides to stop pest infestations. Since California legalized marijuana early in 2018, people are lining up to buy their recreational fix. In only two months they spent around $339 million. Since July, there is mandatory testing of marijuana products to ensure it meets regulations. The Bureau of Cannabis Control is a government organization to regulate Californian licences. It found that 1904 samples from 11,000 tested did not meet regulations. They stopped these products from being sold to consumers. Of these 11,000, 114 samples contained mold and bacteria. A further 403 samples had high levels of pesticides. Pesticides are potentially dangerous and the last thing you want in your marijuana. The two most common pesticides are: • Myclobutanil also known by the trade name Eagle 20, is a fungicide used on gapes. It has had a negative effect on the reproductive systems of test animals. • Imidacloprid is a neurotoxin harmful to bees. Workers using it on food crops have experienced dizziness, eye irritation and vomiting. When you smoke cannabis containing these pesticides the chemicals react. They release toxins that are dangerous to your health. For example, when myclobutanil becomes hot it releases hydrogen cyanide. This gas is so toxic it has been in use in chemical warfare. Not something you want in your cannabis or in your body. The regulations fall short of what pesticides growers can use on their crops. Mostly regulators have allowed the same list of commercial products used on food crops without thinking about the effect on cannabis users. As cannabis is illegal at the federal level, it falls on the states have to regulate pesticide use and ensure growers comply with these. Some states, like California, have strict control and testing procedures. Where in Colorado it took authorities two years from the time it became legal for regulators to test cannabis. And that was only after a worker complained of not having protective clothing when spraying pesticides. When they did test, more than half the cannabis tested came back contaminated with unapproved pesticides. Many states do not have any regulations so it has become a complex problem they are now trying to sort out. Make sure you never buy bud contaminated with broken glass to protect your lungs and your health. Kym Wright is a University graduate and long time freelance writer who writes on many topics across many industries. Cannabis is her niche area of authority and she has been concentrating her time researching the North American cannabis industry and writing about it since 2016.